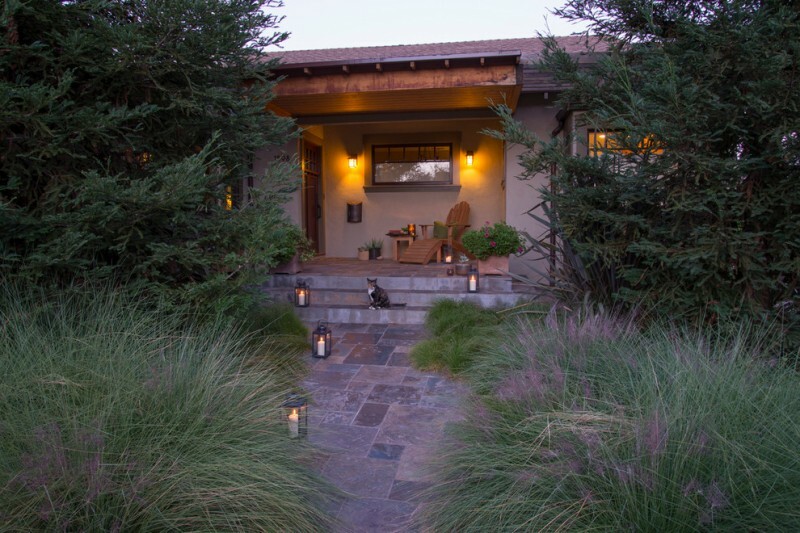 Outdoor lighting ideas for landscape, porch, or backyard take the important role for exterior beauty. A well-lit lighting should be both decorative and functional. 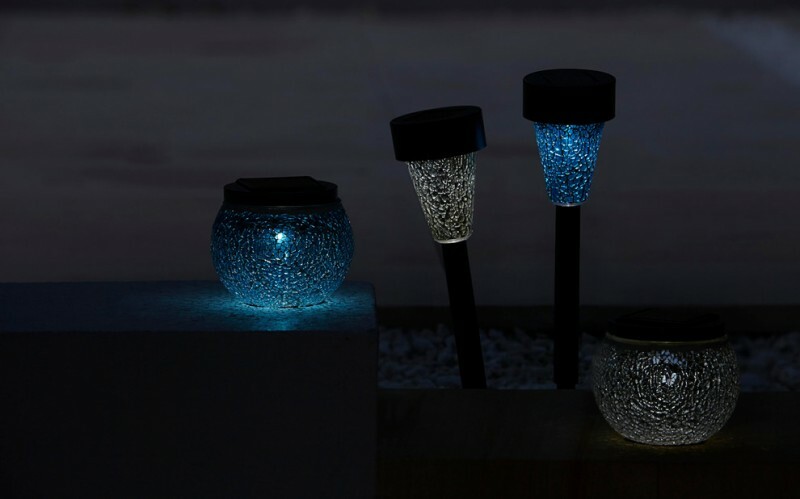 You have hundreds option of outdoor lighting fixtures which are categorized in several types of products such as wall sconces, bulb pendants, outdoor chandeliers, modern bar lights, and many others. Each has different quality based on particular use. Wall sconces, for instance, provide huge quantity of illumination and they’re usually used for entertaining. 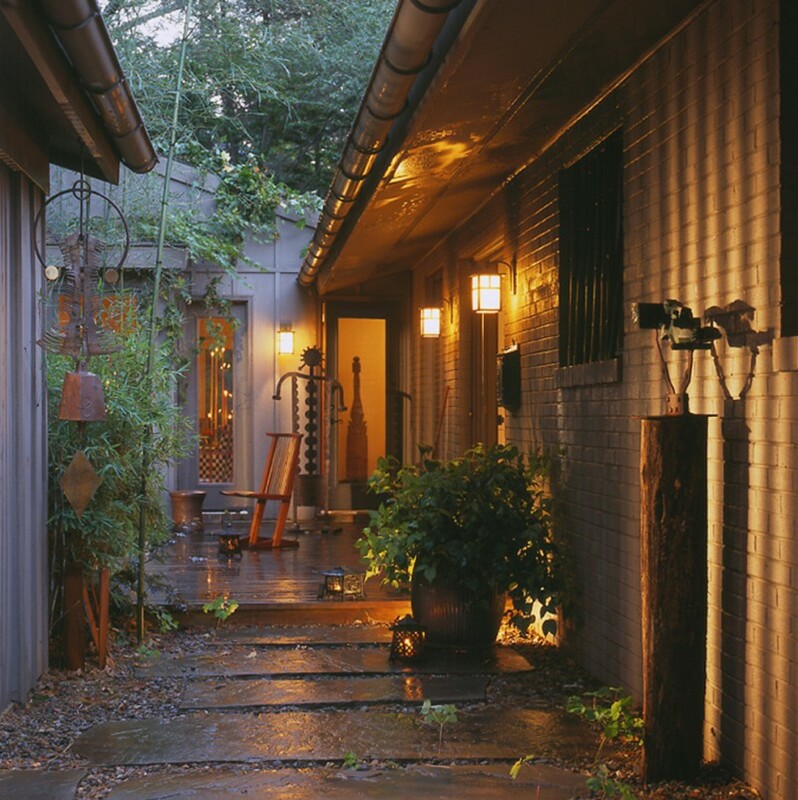 Landscape lighting fixtures, another example, can bring low-lighted and warm feel. If you have curiosity of the outdoor lighting ideas, here we want to share tens of trendy outdoor lighting fixtures you can select for your landscape, patio, porch, or even your backyard. 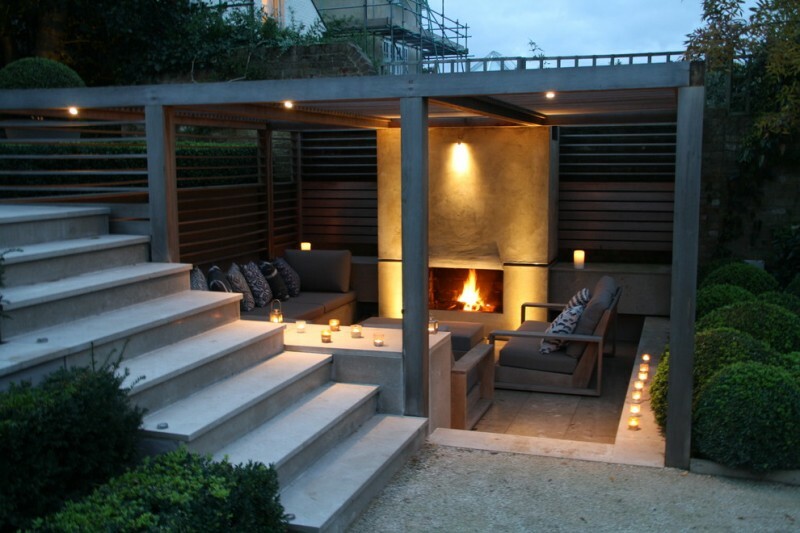 Let’s review each one and we wish these ideas can inspire you more in selecting the best lighting products for your outdoor areas. 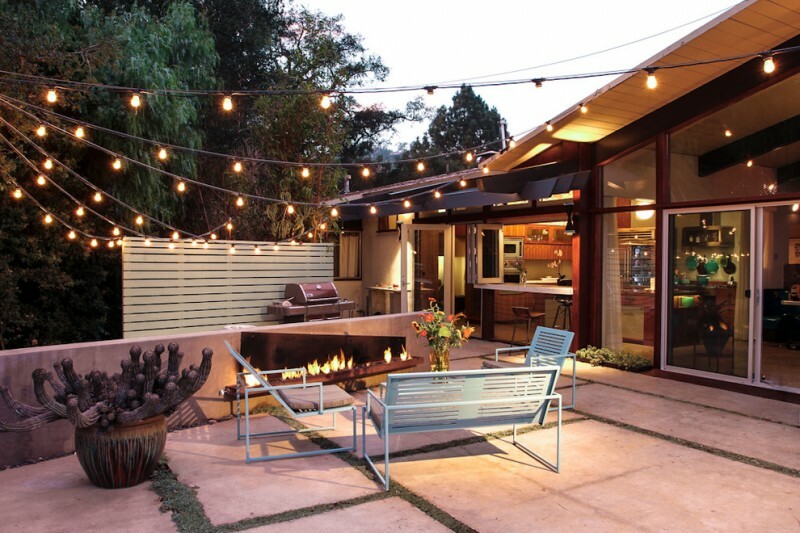 Having multiple bulb lighting fixtures for your patio may be a good choice for a more lit-patio. They surely can ‘break’ your patio. Their shimmering glows will beautify the space at evenings. It isn’t bad to hide the lighting fixtures behind your large palm trees for resulting a dramatically romantic illumination. 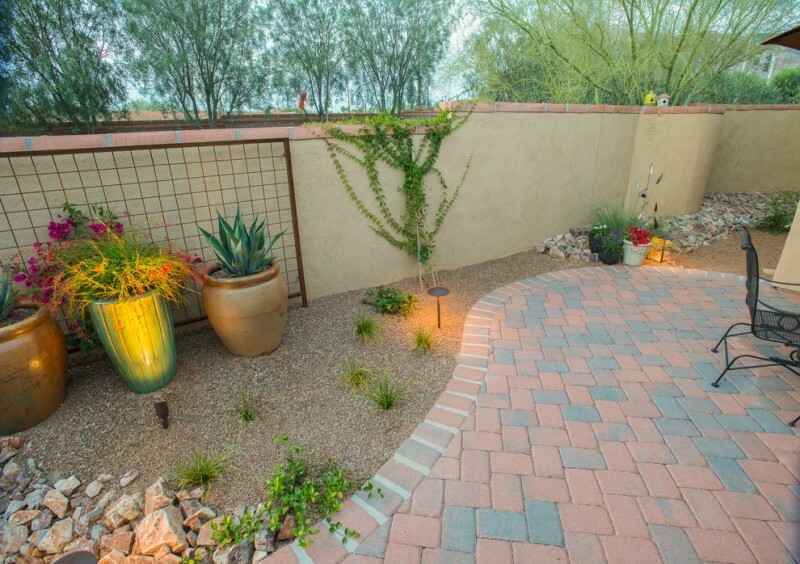 Add another light source along the concrete pathway to light it up, resulting a special look for every walk you have. 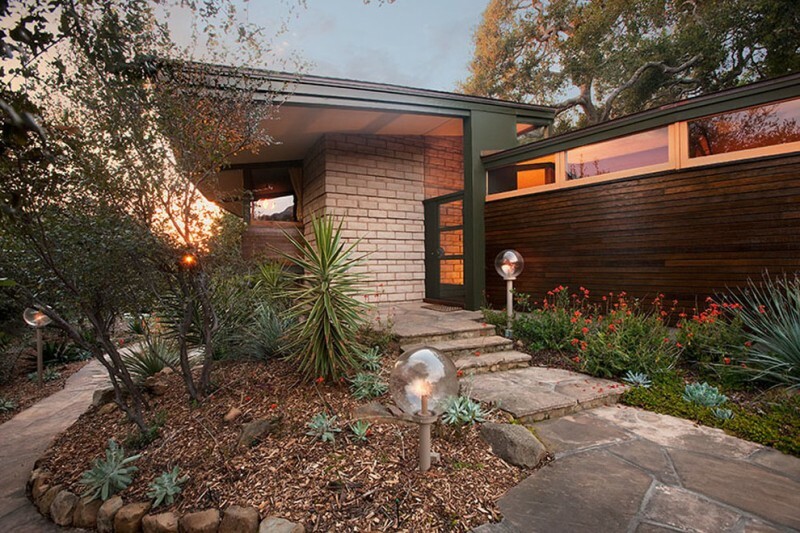 The slashes of dimmed light are resulted from several midcentury modern wall sconces, enriching a glance of rustic tone that enhances this mid century modern exterior home. 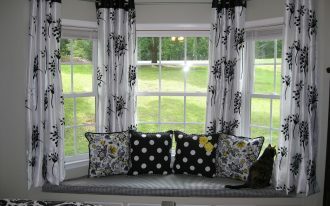 This creates a warmly romantic home’s face. 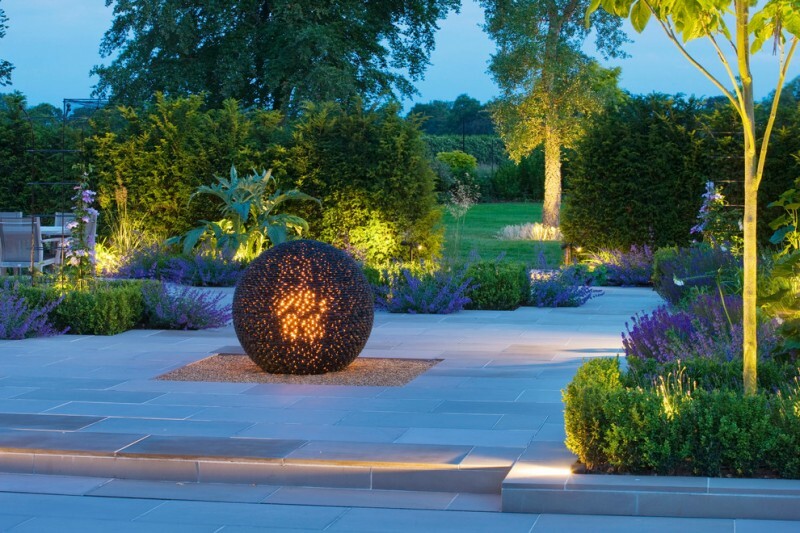 Love a simple but stylish landscape lighting idea? Probably this idea meets your personal choice. Use one or two units of stand bulb lighting fixtures to cover the lighting need to your landscape. 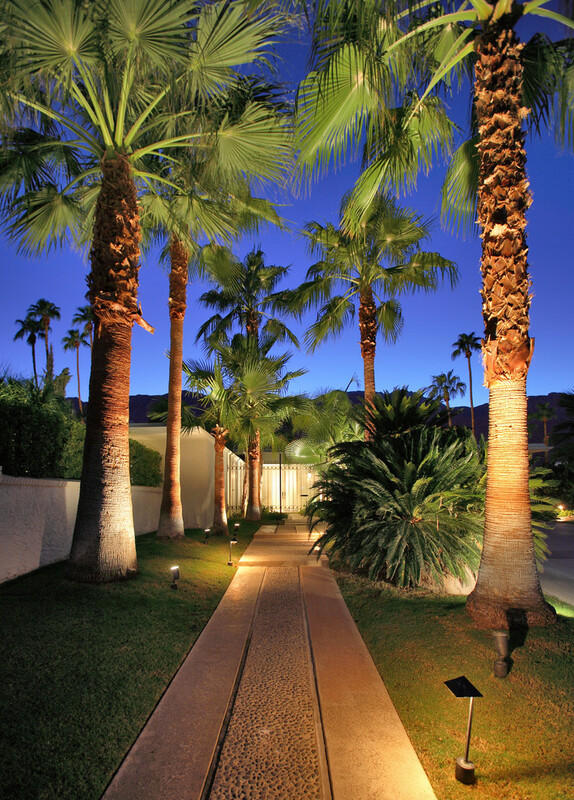 Such kind of landscape lighting fixture assists you to create a mid century concept in your lovely front yard. 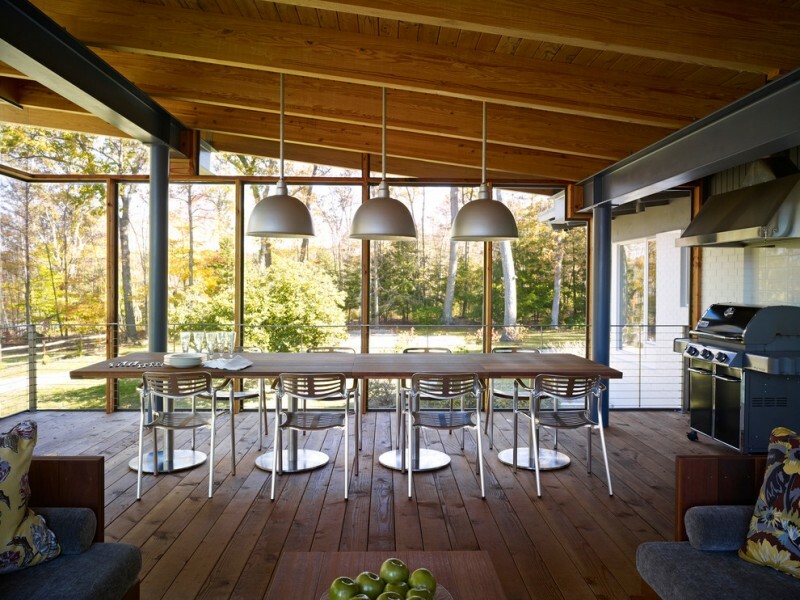 An arrangement of metal-shade pendant lamps for an outdoor grill and kitchen. The lighting fixtures are the real match for all stainless steel appliances and furniture, and they as if offer a balanced look of metal-wood use. What a simple wall sconce! This couple of lighting fixtures are designed in cylinder and colored in elegant black, a pretty contrast against the green exterior walls accented by silver vertical lines and white-trimmed exterior windows. 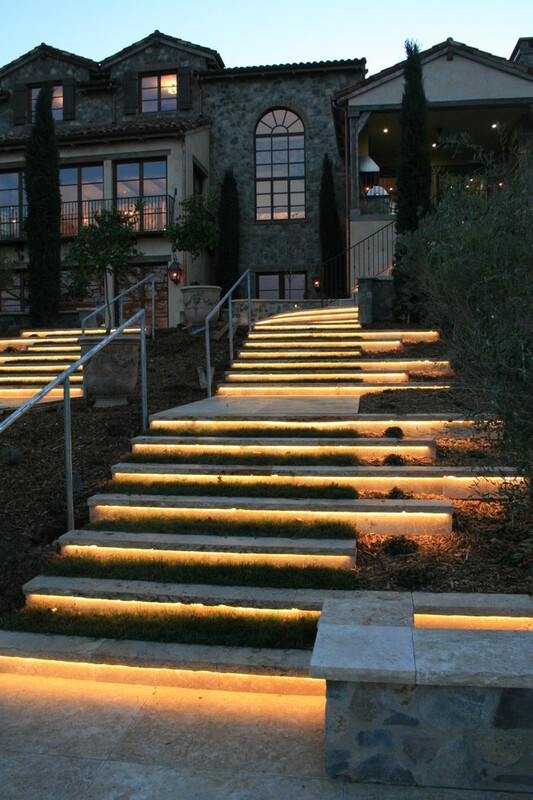 Amazing lit steps idea – install the series of small lighting fixtures exactly on each step’s base and enjoy the beauty. 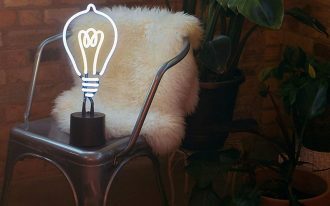 Use low voltage light product to produce low-lighted illumination. With this minimal lighting, now you’ve had artistic stone-lit steps. You’ll never find such amazing lighting idea in world. 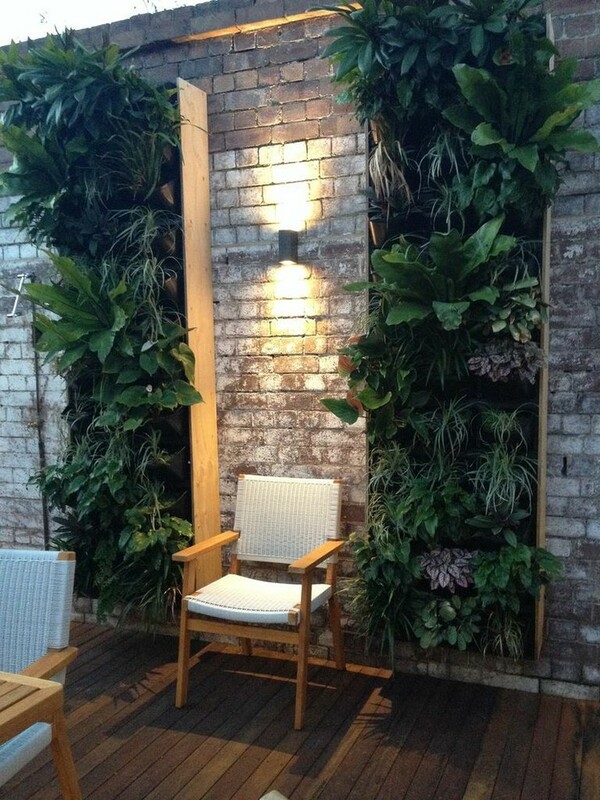 This is an inspiring idea for you guys having such outdoor area. The footpath can be beautified just by giving it some small garden lighting fixtures, especially around the plants. 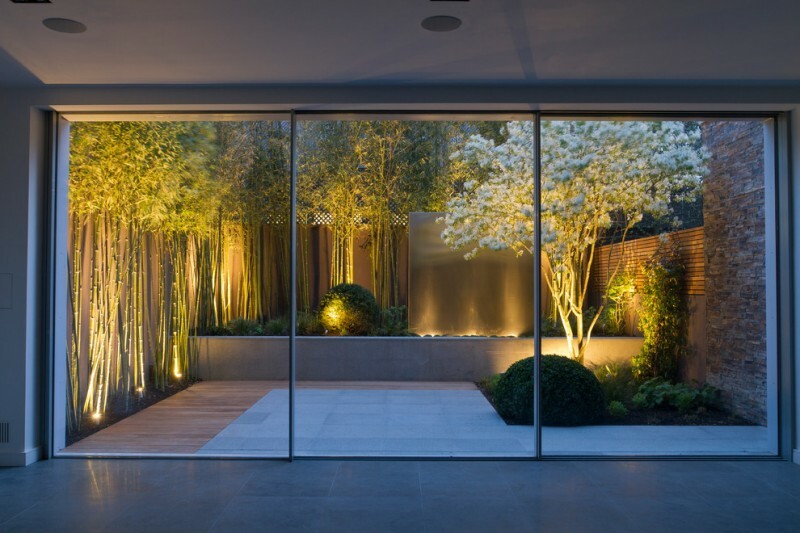 Install the lighting precisely nearest the plants for a beautifully lighted visual effect. You may use more than one landscape lighting products like in this picture. There are two kinds of lighting used in this mini Tuscan landscape: small-sized LED spotlight lighting and small-sized LED pathway lighting. Both have an opposite flash of lights. The spotlight lighting fixture clearly directs the lights upward, while the pathway lighting fixture directly illuminate all objects downward. A large nest ball with flame inside – this is a great idea of lighting fixture precisely used for a contemporary landscaping idea. You don’t need to light every single part of your front yard and patio. By contrast, just highlight a corner you think is so special. Place such a creative and unique ‘flaming ball’ exactly on the center of your chosen corner. The series of candles, fireplace garden, and wall sconce precisely on fireplace’s top – these light sources area effectively light up the nights, offering a romantic nuance for gathering. 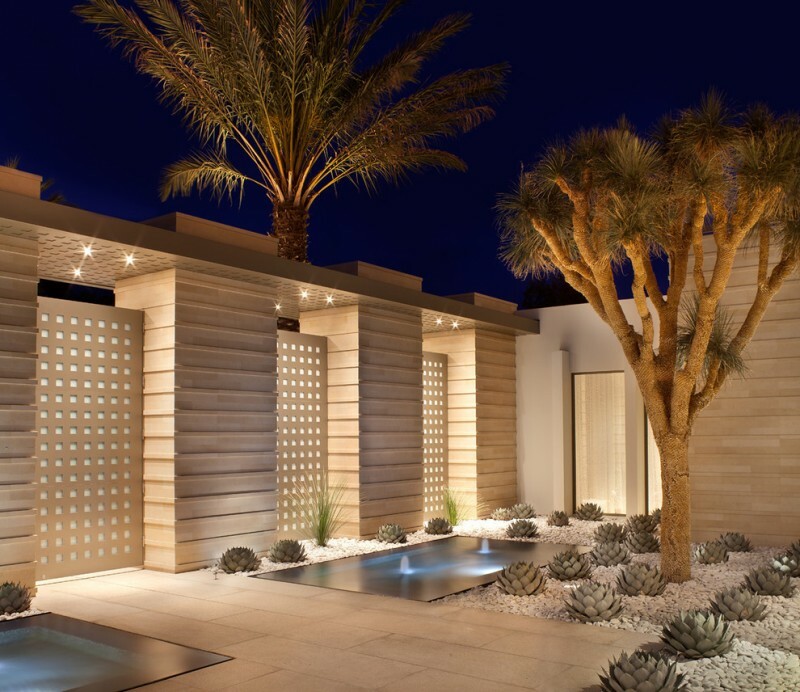 This is an ideal lighting idea for a small contemporary courtyard highlighted with water fountains, succulents, and white natural rocks. The lighting sources are merely focused on the fountains and exterior walls, giving the glimmering lights on pool and surrounds. 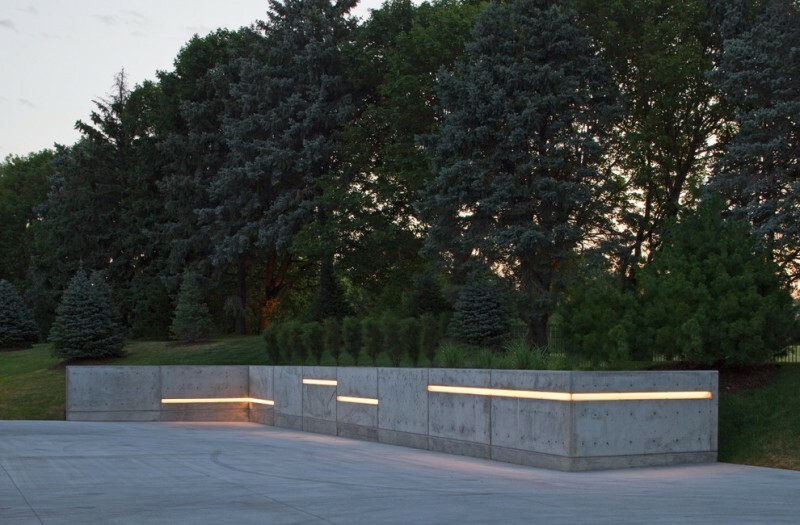 Strips of light – an artfully idea you can apply for your contemporary concrete railing. This is simple but easily grabs everyone’s eyes. Isn’t it? The glowing landscape supported by unique ball lighting fixtures. The lighting fixtures are specially designed as globes with flaming light inside. There are colorful motifs printed on the globes’ outer, creating more colorful lights at night. 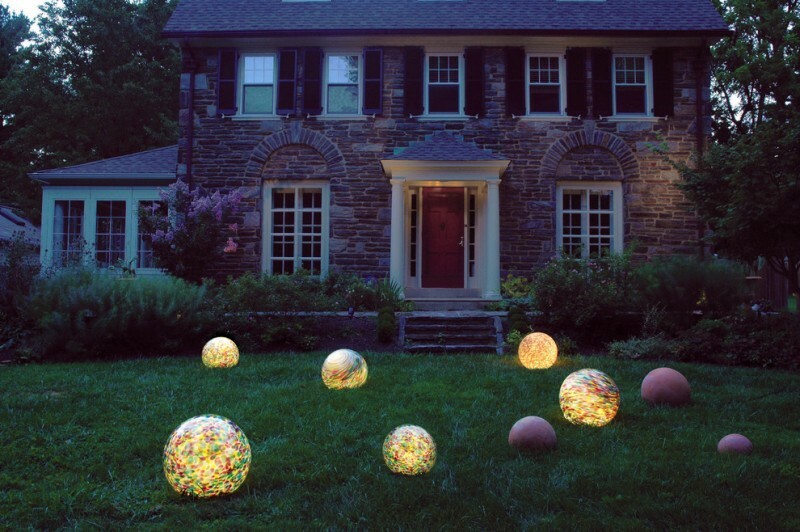 Lay these balls randomly on your green grass yard and enjoy their beautiful lights. 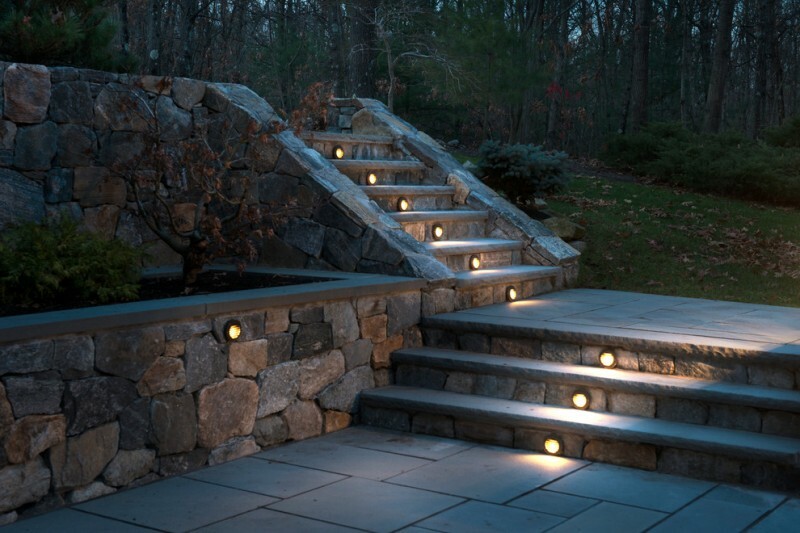 This is another application of ‘night orbs’ for the stone steps heading your home exterior. 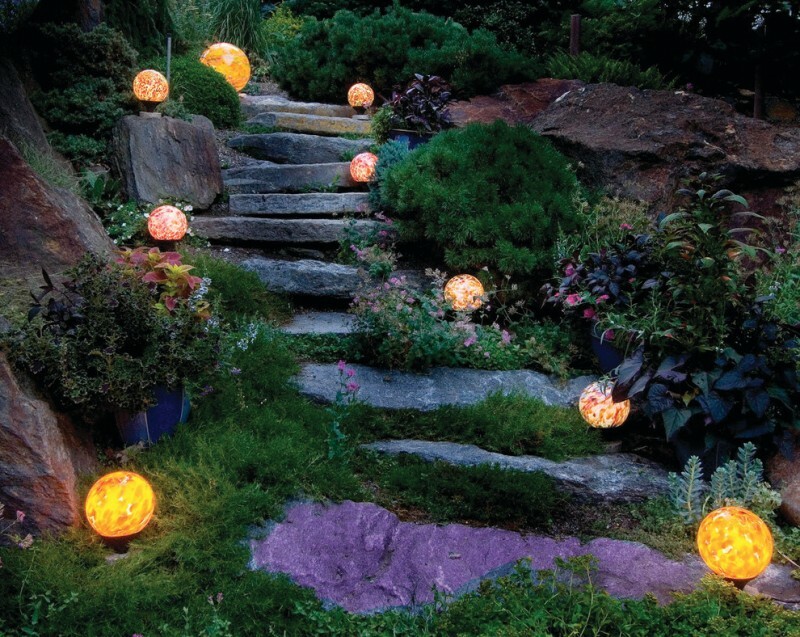 Put these lighting balls near the side steps for a glamorous look; make it greener with simply growing grass. A brief design of lighting idea for garden and front porch. The most interesting spot is the footpath which is surrounded by the messy needle-like plants. Along this path, you’ll see several Windsor lanterns which are put randomly, and the porch is lighted up by a couple of low & dim-lighted wall sconces, giving warm and romantic feel. 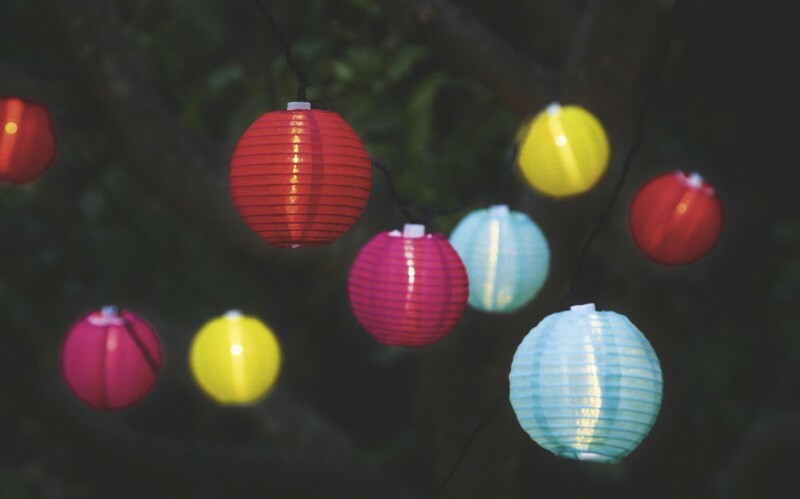 Adorable lighting balls for a trendy landscaping idea. They look like the stand bulb lighting products. The difference is on the coat or shade. 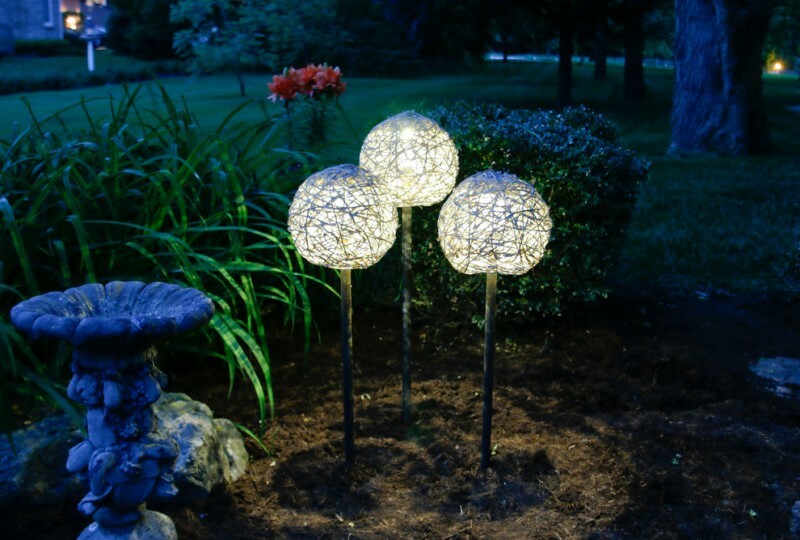 These three beautiful balls have textured accents on surface, giving special look when the lightings are turning on. An ornamental chandelier for garden lighting. Like other chandeliers, this source of light is ideally using for most gathering spots, including this outdoor dining space. The lighting offers us an elegant as well luxurious look for every space. 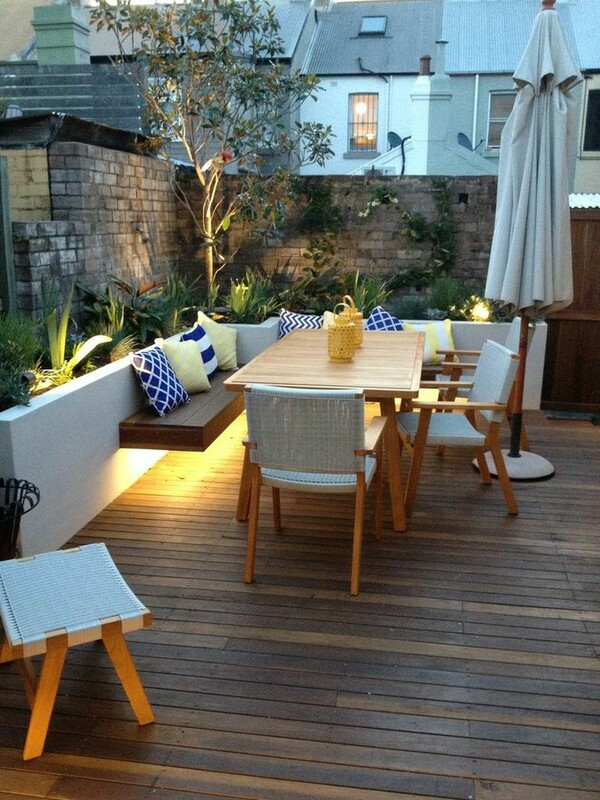 A contemporary patio with wood decking floors, wood furniture set, and low-voltage outdoor lighting idea. All is perfect, especially the lighting choice exposing simple, warming, and inviting look. The lightings are spotted in particular corners, giving us several choices of beautiful lighted space. Lots of small lighting fixtures recessed on wood decking floors and fences. 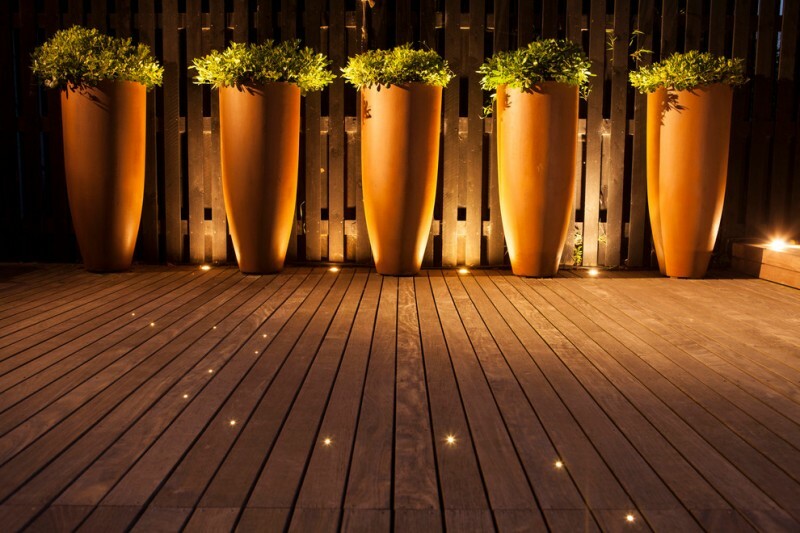 They greatly make these clay-burnt planters wonderfully glowing, creating a special visual effect for the greens. 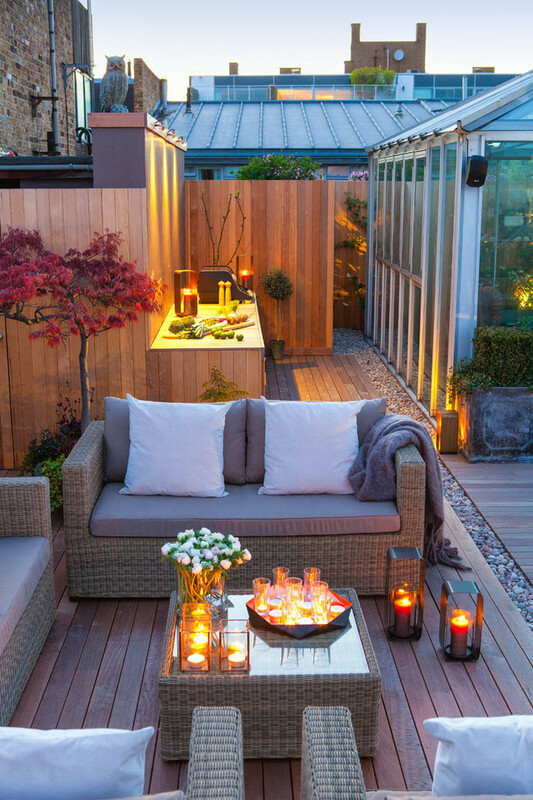 A beautiful small roof terrace design with candles and modern lanterns as the lighting accents. Put a cluster of candles in several spots you want to highlight, and use one or two units of modern lanterns naturally laid on the deck floors. Such layout idea really matches for a romantic dinner set for couples. Terrace patio – an ideal spot for your summer-evenings. 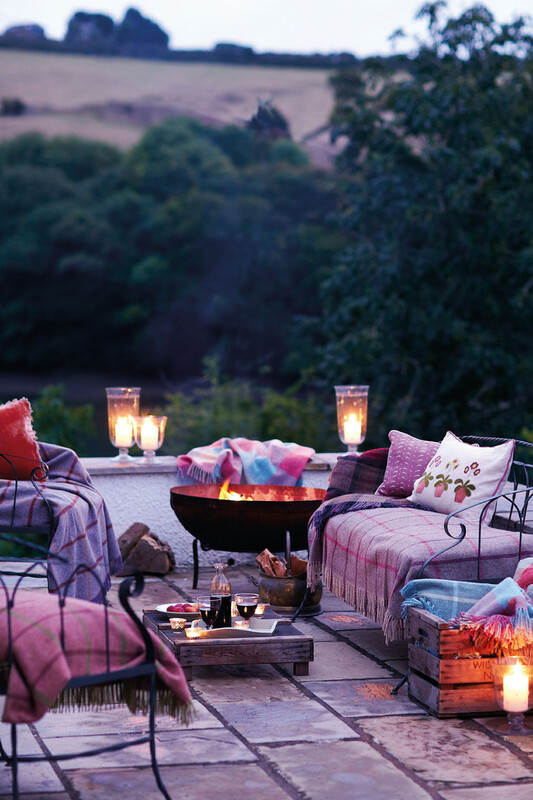 Make it cozier with throw pillows and throw blankets, and use the candles as the lighting sources. The decorative glass cups are well recommended for standing your candles. These cups aren’t only decorative, but also protect the candles from the wind blows, so the lighting can be stable during used for lighting up the space. You can select the solar-powered light for your garden or front yard. With this product, you can bright up your outdoor space without worrying more budgets for electric bills. Now, you just need to choose which light kind you prefer to use for your garden. The bulb-strings, stand-alone lights, or even creative pendant lights are available for you. 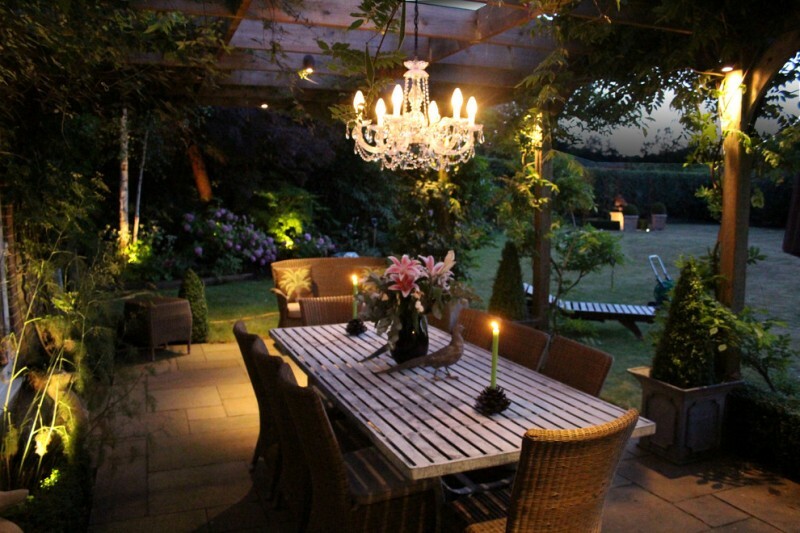 Colorful lanterns powered by LED – the most recommended choice for a garden or patio with dark atmosphere. The design looks traditional but it’s supported by high-tech LED bulb inside. The colors will be vividly brighter when the lights are turned on, giving quite stunning objects in the darkness. 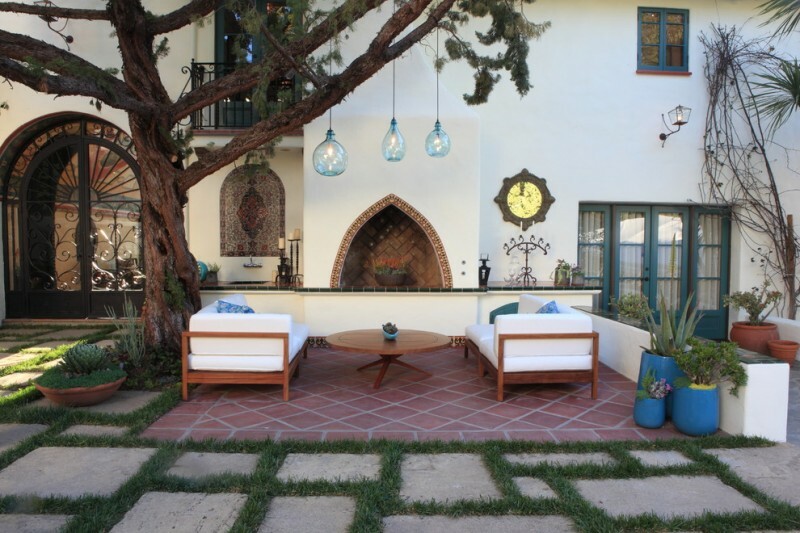 Expensive lighting fixtures for contemporary patio, deck, or front porch. The resulted light is low-illuminated yet elegantly creates minimum lighting. 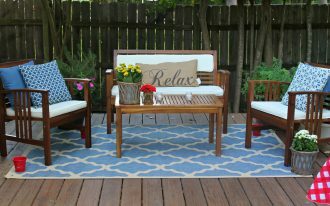 It’s perfect for a romantic spot like roof top, balcony, and other outdoor privacy spaces. Glowing greens with small decorative lights. 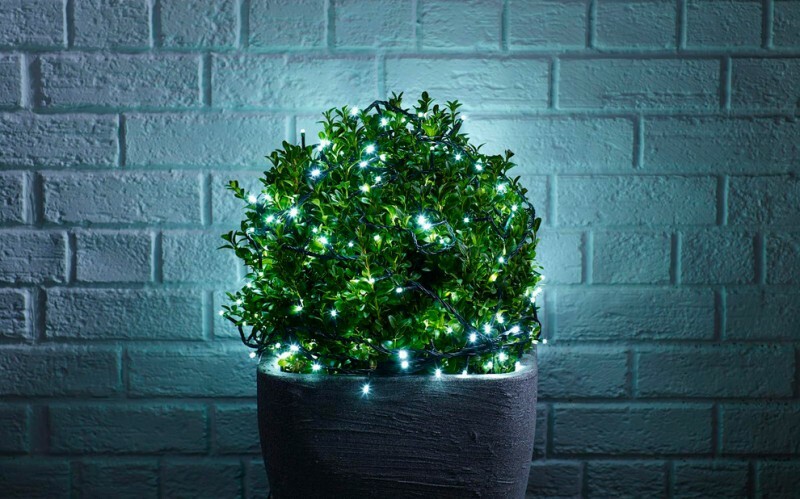 Make your lovely greens more sparkling just by adding the strings of LEDs randomly covered into the wholly greens. It’s an instant way if you want to create a charming green collection. 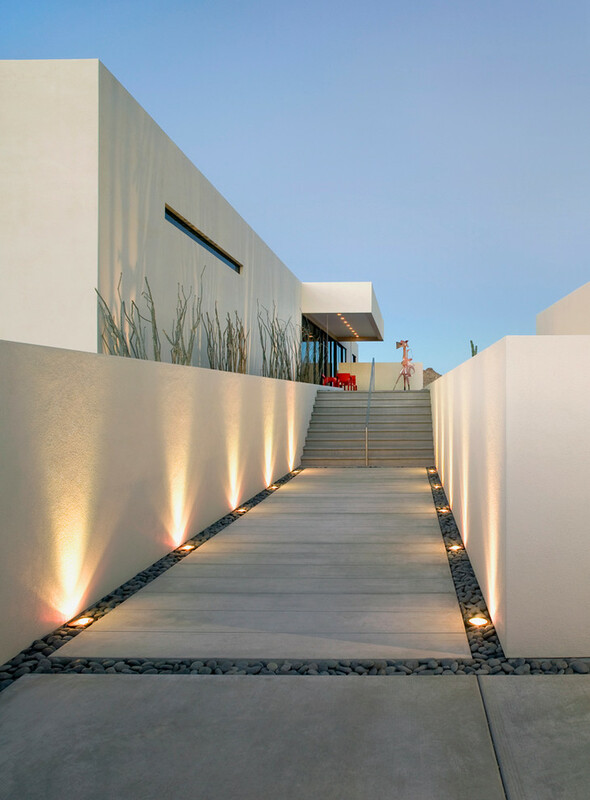 Create your pathway more stylish and trendy with such modern lights. These lights are visually unique. 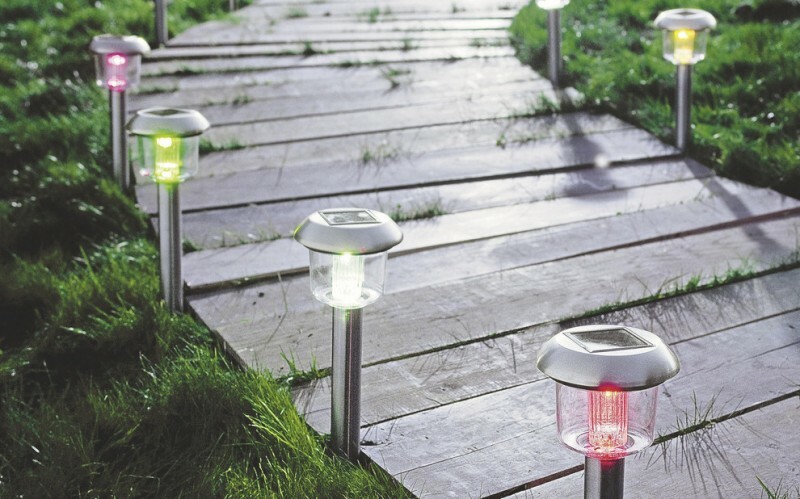 Each unit has different striking electric bulb which can light up along the path. They’re also supported by metal stands. 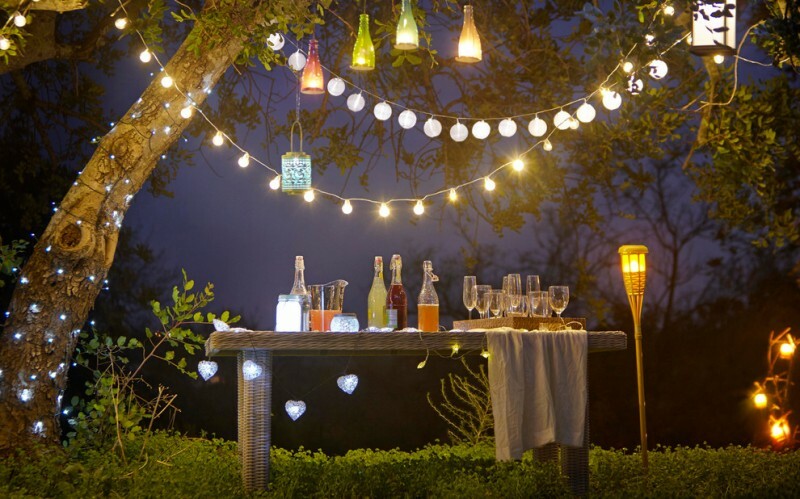 Garnish your garden trees with these decorative strings of lights. 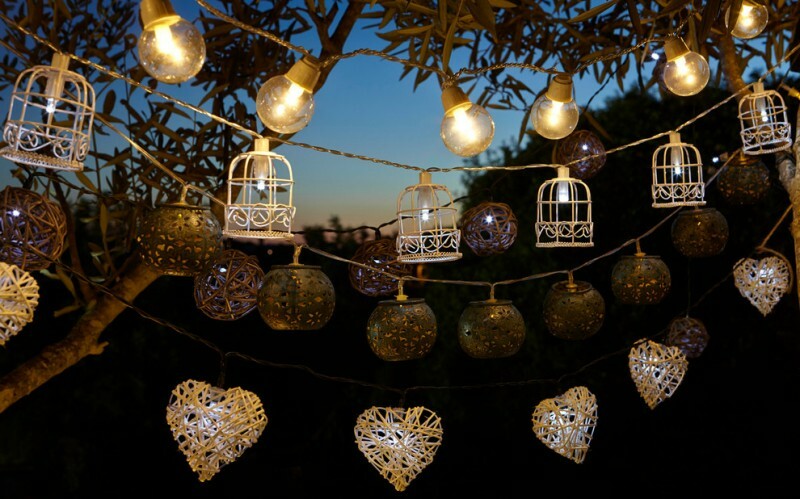 Re-shape the light fixtures in multi-choice of attractive shapes such as hearts, mini bird cages, or even cherries. You can make them by yourself with using second-hand things from your shed. 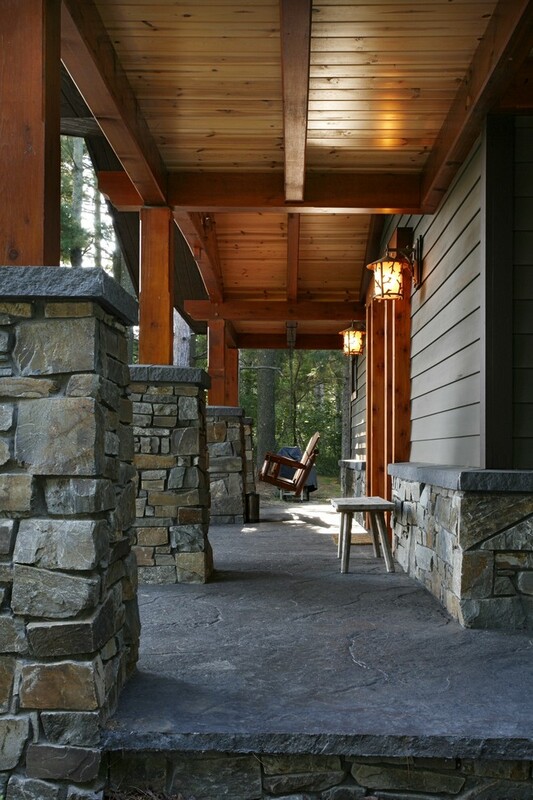 Recessed light fixtures for gate, an instant way to decorate and to highlight your simple wooden gate. 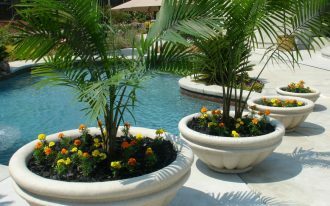 Make sure to consider your safety since they are installed within soil. It’s suggested to just install a pair of light fixtures for either gate’s side. 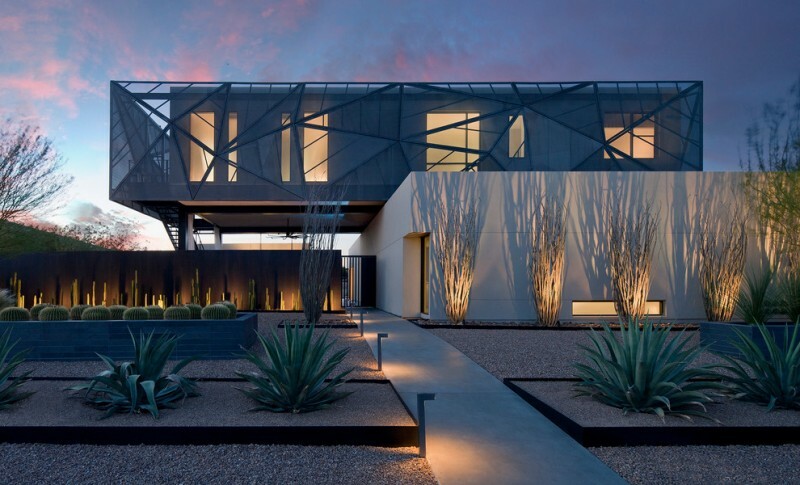 A modern minimalist landscaping idea accented by lighted grass. When the night comes, we’ll see interesting silhouettes created by enlightened grass. The pathway, in other hands, is beautifully illuminated by low-lighted garden lamps installed along the pathway. 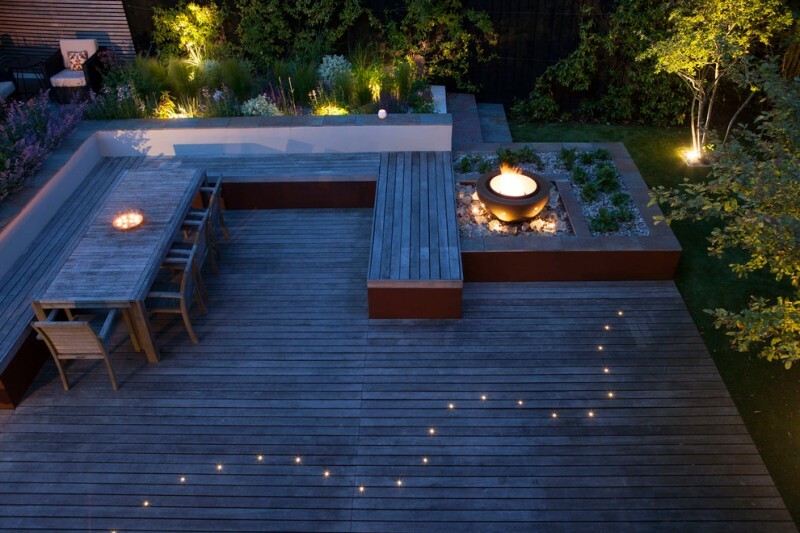 Overall, this landscape lighting idea is really simple yet modern. 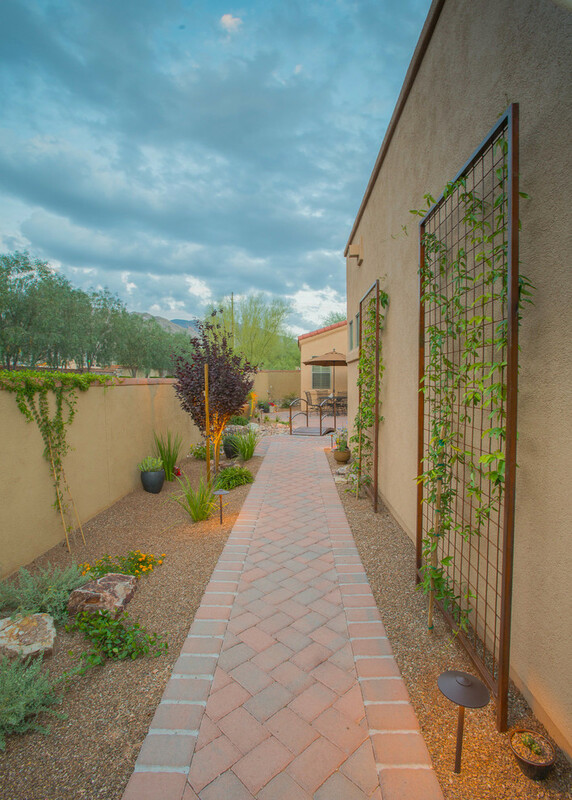 Don’t limit your creativity in re-setting up your landscape. Do vary your outdoor area with adopting a unique and out-of-box concept like this oriental-style landscape idea. Enlighten your trees and bamboos with some series of garden light fixtures that perfectly illuminate those trees and surrounds. 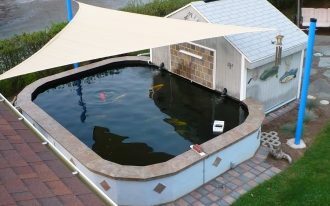 For your information, a strip along the pool’s edge is LED light or ‘rope’ light. The Mediterranean entrance, additionally, is enlightened by a couple of wall sconces. Both wall sconces and rope light produce elegant and warm lighting effect to the space, the best match for the textured stone exterior walls. Traditional wall sconces simply give the best illumination for such an antique exterior. The designer uses low and soft lights for plants and light beneath the floating bench, giving a simple yet elegant lighting effect. A modern wall sconce illuminating a single chair. A simple light application for huge elegant result. This idea can be adopted for highlighting a particular object you want to expose. 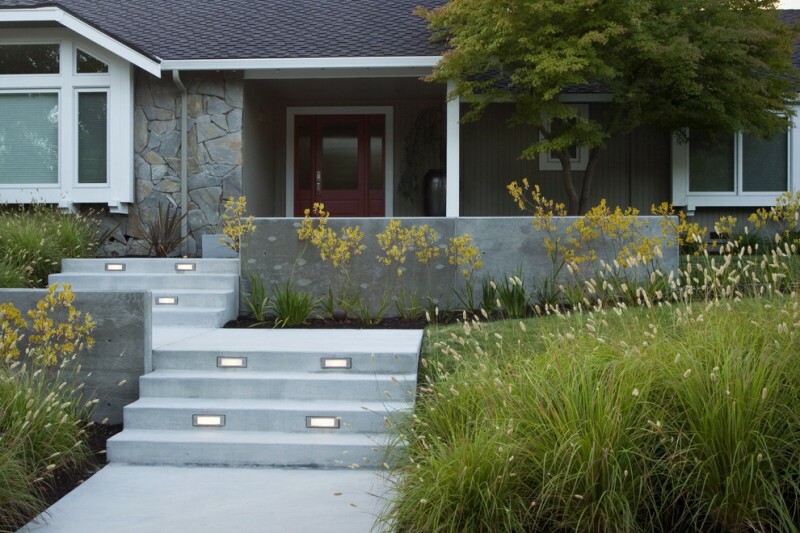 There is a new way to treat your contemporary front yard, especially your concrete steps; illuminate each step and add some lighting fixtures to each garden’s side. 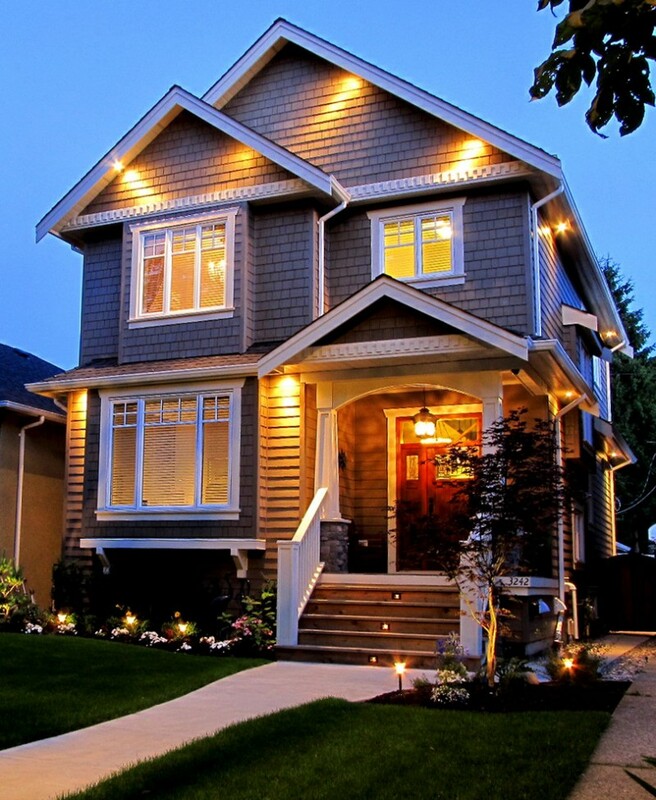 Select the modern lights to provide adequate illumination to your green area, but not the steps. Use minimum lights for each step for a dimmed light effect. Artistic exterior light fixtures for a fancy illumination. 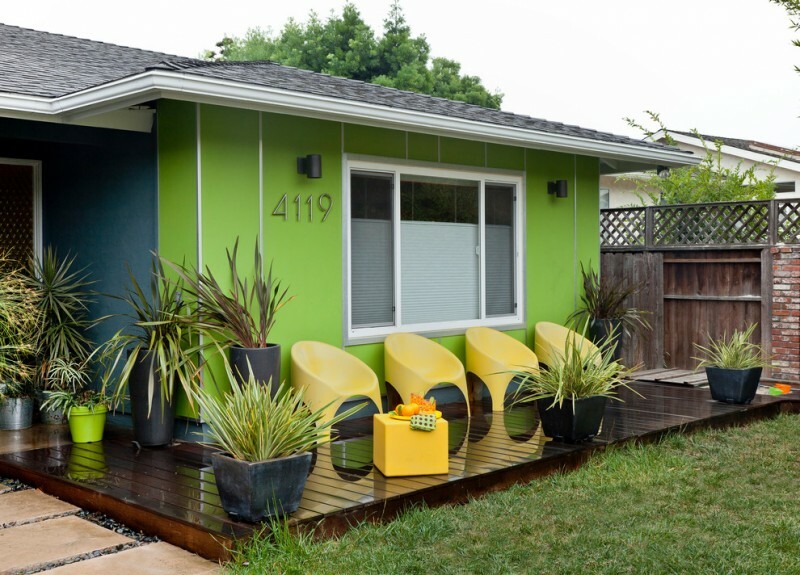 Select the fixtures that can both beautify and brighten your exterior. These fixtures, for instance, can amazingly result a sunrise-like glows garnishing the walls. Pendants always become the direct focal points for any areas. This kind of hanging light can be freely installed both in same or different height & size. 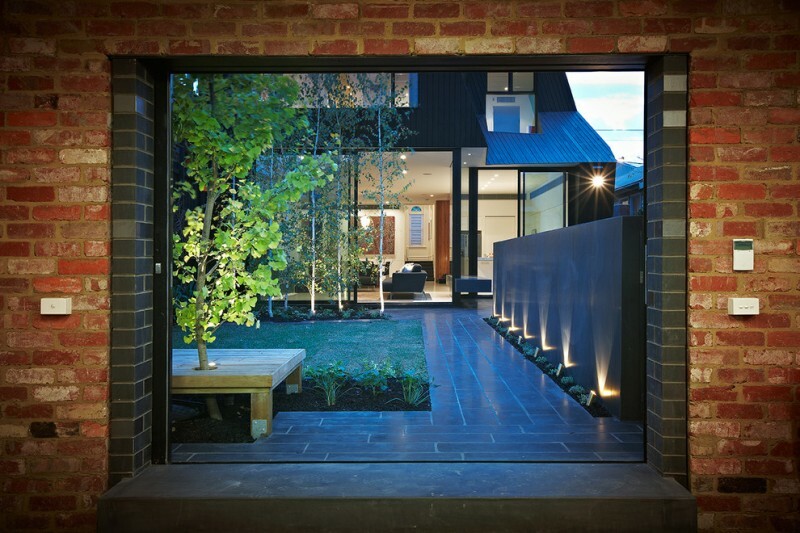 Cylinder wall sconces in black – a recommended product for your contemporary exterior. The design represents the contemporary value that emphasizes the function and simplicity. This is another idea of lighting fixture for stone steps. Different to previous product, this one is designed in round shape and installed exactly on each step’s center-underneath. 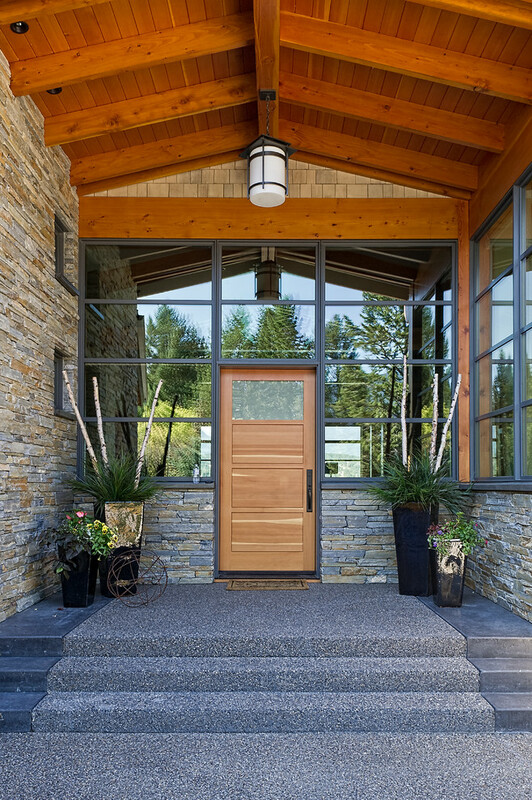 Wall sconces aren’t only designed for exterior, but they are also designed for other uses, including the front entry gate. 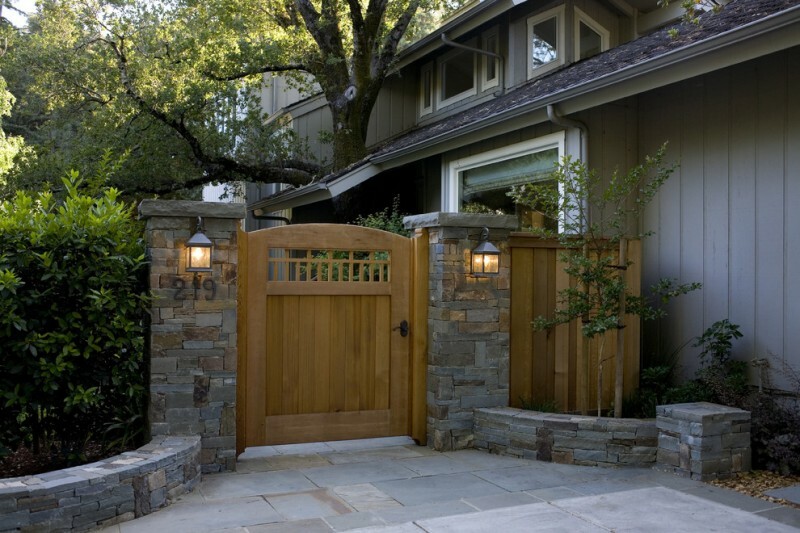 These traditional wall sconces, for example, quietly blend with the rustic entry gate. 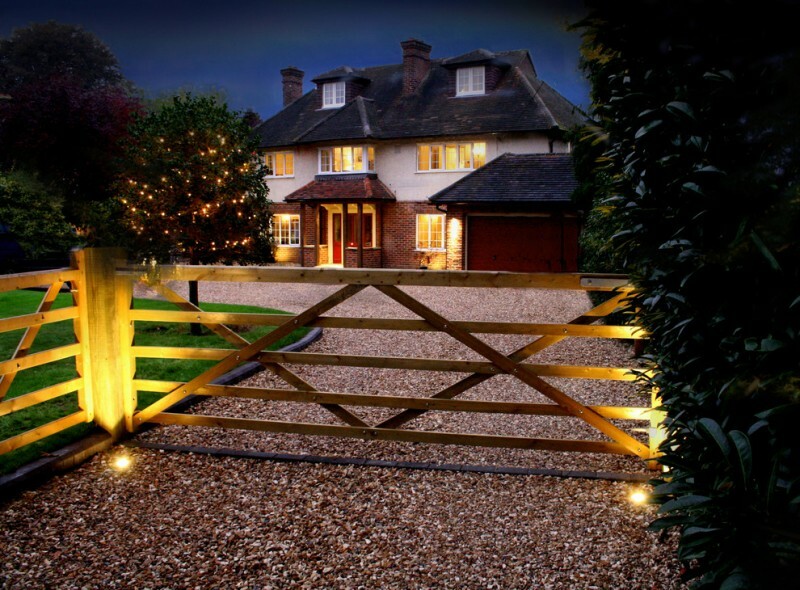 The resulted light produces low lighted illumination that perfectly fits the gate dominated by wood and natural stones. It looks like an architectural frame with interior courtyard as the object. 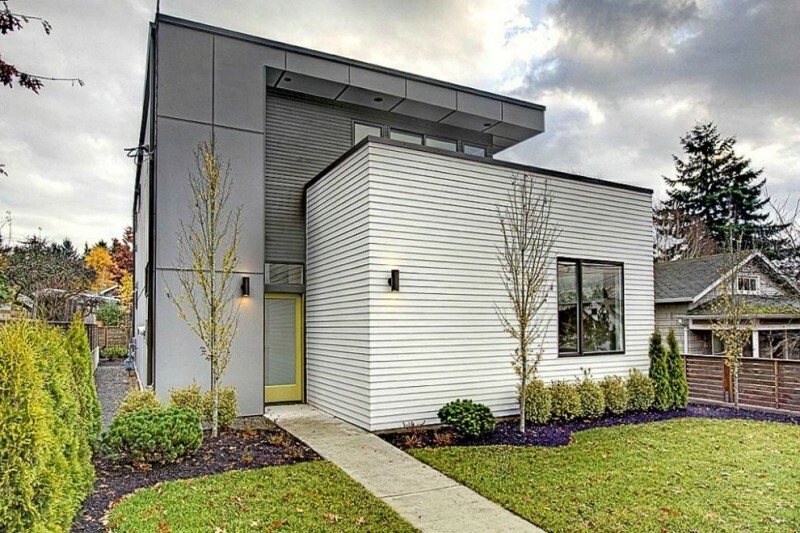 The homeowner quite loves a contemporary style for interior and exterior. To support his personal style, he adds several spotlight fixtures headed the concrete walls, resulting an amazing lighting effect as he wants. Some hidden lighting fixtures probably are installed behind the rafters. Put the lights randomly to produce more natural look and just spotlight particular spaces which want to expose. Actually these are the recessed garden lights which are installed beneath the decorative stones. One thing that makes them much more interesting is the resulted light that wonderfully spreads out against the walls, producing beautiful lighting effect on walls. 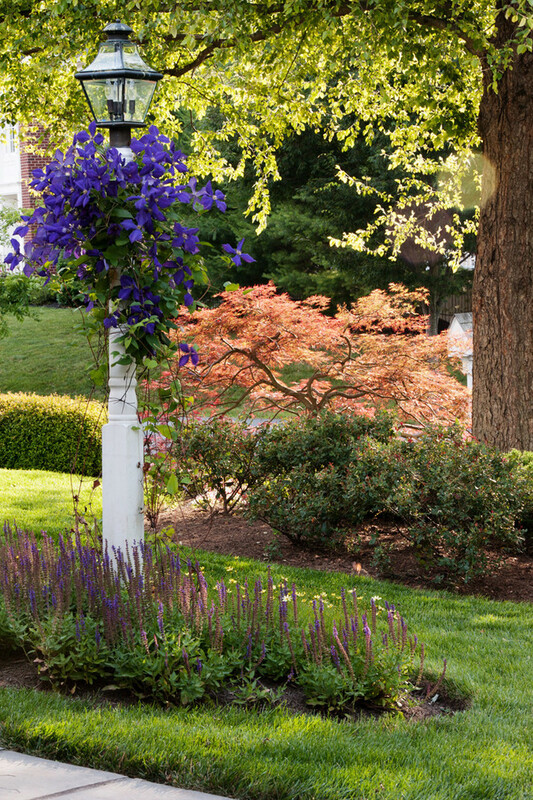 A traditional stand light fixture for traditional landscape. You don’t have to add a lot of fixtures, you just need one that can accommodate adequate illumination. Bigger one is better. Wall sconces and hanging lamps are not same, but complement each other. 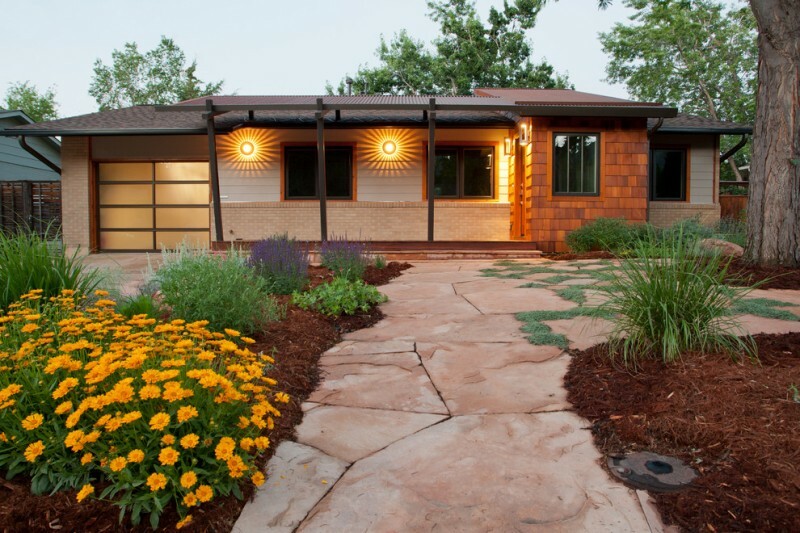 Their design is simple and presents traditional value, really matching with the stucco exterior walls. Rustic wall sconces with black wrought iron cover and holder – they really blend with rough-textured concrete and stones exterior. This is just an ornamental light fixture for porch. 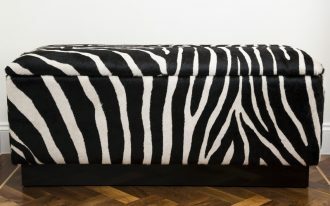 The custom design possibly makes us selecting the best as we want. 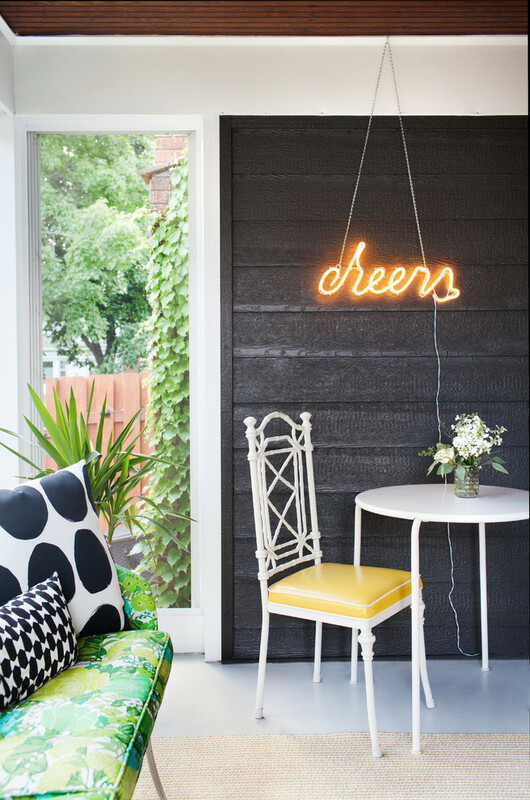 Such kind of light fixture, indeed, suits something black or dark like these black-finishing siding exterior walls. 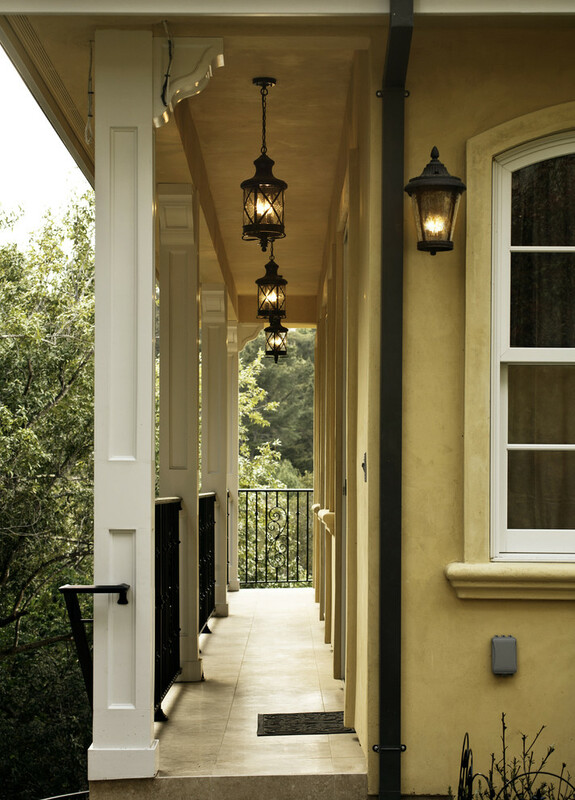 Select such a simple and plain-colored ceiling light fixture for your craftsman exterior. Why? 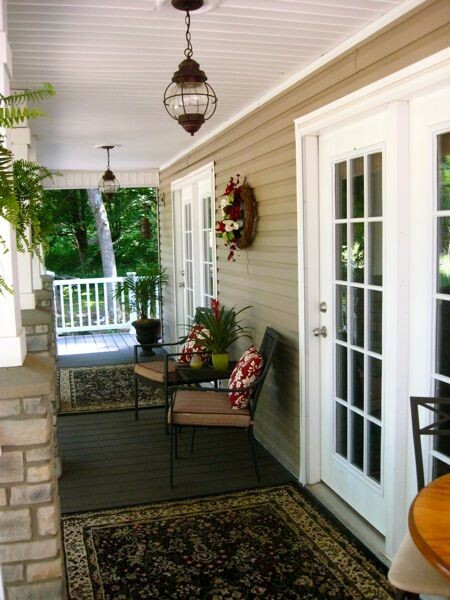 Its simple design won’t ‘break’ the art and beauty of original craftsman details. Rustic hanging light fixtures – not only as the primary light sources but they are decorative items successfully accenting the plainly white ceilings.